16.08.2011. 23 Rittal in commercial and technical vocations at Rittal have now made the leap into the world of work. On Tuesday 9 August, a ceremony was held at the company headquarters in Herborn to present them with their certificates. The trainers explicitly praised the high standard of exam results. They had been looking forward to this moment and were clearly proud of their achievements: For two young women and 21 young men, last Tuesday marked a successful end to an important period in their lives – the completion of their vocational training at Rittal. The young people can now officially call themselves machine and plant operators, production mechanics, electrical installation technicians, warehouse logistics administrators, electronic operating systems technicians or tool mechanics. All of them can look to the future with optimism: Twenty have already received permanent job offfers from Rittal and landed positions at various plants across the region – in Herborn, Rittershausen, Burbach, Wissenbach, Rennerod and Hof – while the remaining three have decided to continue into further education. At a presentation ceremony at the company headquarters in Herborn, Dirk Sengl, Rittal plant manager in Rittershausen, gave the young people some wise words to send them on their way. To practise a vocation successfully, he said, you need to maintain lifelong learning, be open and honest to colleagues, and understand your superior's requirements precisely. 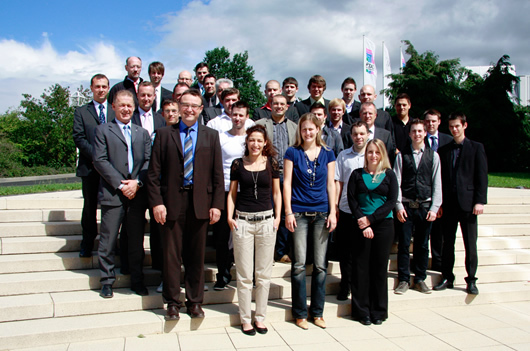 The Rittal trainers were delighted with the trainees’ achievements. "Our young people have performed to a very high standard. We urgently need well-trained young people like these if the company is to reach its growth targets", explained Matthias Hecker, Head of Commercial-Technical Training at Rittal. As the event drew to a close, Hecker also thanked his trainer colleagues for their excellent work over the past three years. Trainers and plant managers are delighted with the 23 Rittal trainees who have now successfully completed their training and made the leap into the world of work.